The activity was the first time many of the residents had tried bagels and wraps, with tige r cobs, a sesame seed loaf and beetroot and raisin bread also on offer. They had a choice of pork, beef, cheese, tuna and chicken, alongside salad, for the fillings. 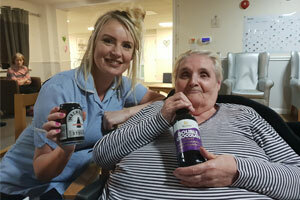 The home’s activities coordinator, Angela Hedley, came up with the idea of the stout and sandwich afternoon. She said: “The simple things can sometimes make for a really memorable day for our residents.